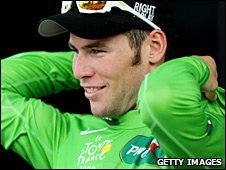 Mark Cavendish again left his rivals in his wake to win stage 11 of the Tour de France and equal Barry Hoban's British record of eight stage wins. The Manxman also takes back the green jersey from Thor Hushovd who, along with Tyler Farrar, attacked him in the last 200m but was beaten to the line. Italy's Rinaldo Nocentini keeps the yellow jersey, with a six-second lead. Britain's Bradley Wiggins is fifth overall after race judges returned time he lost in a crash in stage 10. Pre-race favourite Alberto Contador is Nocentini's closest challenger, while his team-mate Lance Armstrong is in third place, eight seconds off the lead. The early part of Wednesday's 192km route from Vatan to St Fargeau was marred by several crashes, before Belgian rider Johan Van Summeren and Marcin Sapa of Poland broke away. That duo stayed clear until the final 4km, setting up the sort of bunch sprint finish that has become Cavendish's territory, but, with the finish on an incline, he was not the overwhelming favourite to triumph. For the first time in this year's Tour, the 24-year-old and his Team Columbia team-mates were given a tough test in the closing stages but they adjusted their tactics accordingly. Several Milram riders attempted to crowd out the Team Columbia contingent at the front of the peloton in the final 300m. Hushovd also attacked early, about 200m from the line, but Cavendish was able to stay clear and he also held off Farrar's late surge before again accelerating away over the finish line. It was beautiful the way the guys could just adapt to the situation to deliver me to a perfect position to sprint. "It was slightly uphill in the last 500m so we knew we had to leave it later, it was going to be different from the full-blown fast lead-out that we're used to," Cavendish said afterwards. "But we still had to take control. You saw how well we worked. Normally we have two guys in the last kilometre but today we had four because I had to be delivered to 150m (from the finish). "I kept the gears small and I was able to get the jump on Thor and win. "It was beautiful the way the guys could just adapt to the situation to deliver me to a perfect position to sprint." The stage win was Cavendish's fourth of this year's Tour, and second in successive days. It also means he leapfrogs Hushovd to move top of the points category with 176 points, seven ahead of the Norwegian. Cavendish could have the chance to go for another stage victory - and break Hoban's record - on Thursday, at the end of a 211.5km trek from Tonnerre to Vittel. Hoban, 69, won his eight stages between 1967 and 1975 - the last at the age of 35, while Cavendish is taking part in only his third Tour. There are 170 riders left in this year's Tour after Norway's Kurt Asle Arvesen withdrew before the race left Vatan. Arvesen had broken his collarbone in a crash on Tuesday. 2. Tyler Farrar (US/Garmin) "
3. Yauheni Hutarovich (Bel/FdJ) "
4. Oscar Freire (Spa/Rabobank) "
5. Thor Hushovd (Nor/Cervelo Test Team) "
6. Leonardo Duque (Col/Cofidis) "
7. Gerald Ciolek (Ger/Milram) "
8. Lloyd Mondory (Fra/AG2R) "
9. William Bonnet (Fra/BBox Bouygues Telecom) "
10. Nikolai Trussov (Rus/Katusha ) "
34. Rinaldo Nocentini (Ita/AG2R) "
38. Bradley Wiggins (GB/Garmin) "
43. Alberto Contador (Spa/Astana) "
54. Lance Armstrong (USA/Astana) "